This statistic shows the results of a survey conducted in the United States in March 2017, by ethnicity. U.S. adults were asked if they could imagine themselves using an app to relieve stress/promote inner peace through meditation, light yoga or other activities. 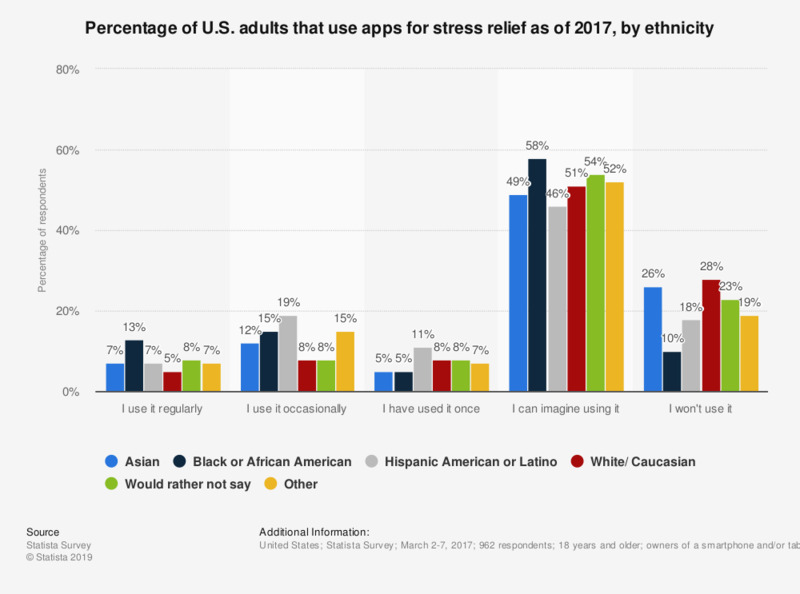 In total, 5 percent of White or Caucasian respondents indicated that they regularly use an app to relieve stress, compared to 13 percent of African American or Black respondents. Original question: "The following is a selection of different e-health apps for smartphones and tablets. Could you imagine using any of them? [ answers for: apps to relieve stress/promote inner peace, for instance through meditation, light yoga exercises, or similar activities (e.g. smiling mind, Mindfulness, Breathe2Relax)]"